At SDCC 2016, [adult swim] showed some rough animation featuring Rick Sanchez as a pickle. By the time the episode aired a year later, fans were going wild for Pickle Rick. Why? After all, it's not like Rick and Morty fans to mindlessly embrace whatever they're told to, right? And as Milhouse and Snakes on a Plane both separately proved, you can't force a meme. Part of the appeal is definitely the work of the writers. In the episode, Rick turns himself into a pickle to avoid going to therapy - since the new state of being is unrelated to the rest of the plot, they could have turned him into anything. Apple Rick. Sausage Rick. Ball of Yarn Rick. It all would have worked exactly as well, but none of it would have been as funny. Even if they just picked a pickle on a whim, it was the best choice available for several reasons: first of all, "K" is considered the funniest sound in the English language, both because it's one of the least-used letters (and comedy relies on the encounter of the unexpected) and because of the shape your mouth makes when you fully vocalize it (the back of your tongue hits the roof of your mouth - a funny sensation - and the corners of your mouth draw back, just like when you smile); plus, go ahead and double it, because there's a nice internal rhyme that ties the two halves together in a way that, say, "Corn Cob Rick" wouldn't, even though that theoretical alternate-universe interpretation of the character would include a free bonus third K sound! Okay, enough scholarly interpretation, let's talk toy. 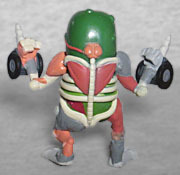 Pickle Rick is not simply a pickle with a face on it (though that would have made sense as one of this series' many store-exclusives) - rather, he's wearing the exosuit he crafted from various leftover rat parts: the ribcage, spine and pelvis cradle his gherkiny frame, while the arms and legs are a grab bag of bone, muscle and skin, He stands squatting slightly, with both fists raised defiantly by his sides - honestly, it's a very "Wolverine" kind of pose. 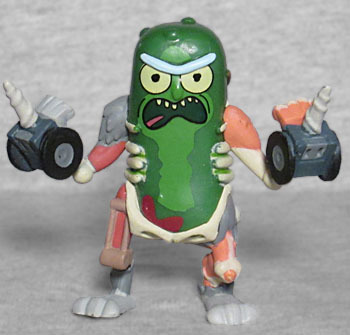 This version of Pickle Rick is taken from when he was using the screws as his weapons of choice, not the X-Acto blades, nor is he carrying his AA-powered laser cannon (both things which, again, would have made for good exclusive variations). As far as the pickle itself goes, a few of the bumps on it are molded, and the only molded facial features are the nose and eyebrow. According to the back of the box, Pickle Rick was originally going to be a 1:24 figure, only available in every other case. Which may have been the stupidest plan ever. The character was mind-bogglingly popular, yet he wasn't going to be in every case? Heck, every retailer could have had their own exclusive version: this one in the regular cases, one with blades at GameStop, one with a laser at Hot Topic, and a plain pickle at Target. And if Toys Я Us had still been around, one with a jetpack and mask. Wait, Walgreens! Walgreens gets exclusive Mystery Minis now, they could have had that one! There could have been five different Pickle Rick toys, but if Funko hadn't screwed up the ratios (welcomely making everything 1:12 in every case), the single version we do get would have been annoyingly rare. As I have no chance of coming across these in the wild, I'll probably pick up the two POPs. Pickle Rick is incredibly played out as a forced meme. That is all. Actually, that isn't all. You should definitely review the Mcfarlane Jareth figure that came out this year Yo Go Re!